Transmedia storytelling is a new form of media that is exploding and you may not even know it. As explained in the article “Transmedia Storytelling 101” by Henry Jenkins, the many ways shows use trans media is thru webisodes, character twitter accounts, character blogs, web comics, minigames, and wikis. Certain television shows may use them all or just one of them. Glee is a hit television show that is aired of Fox. 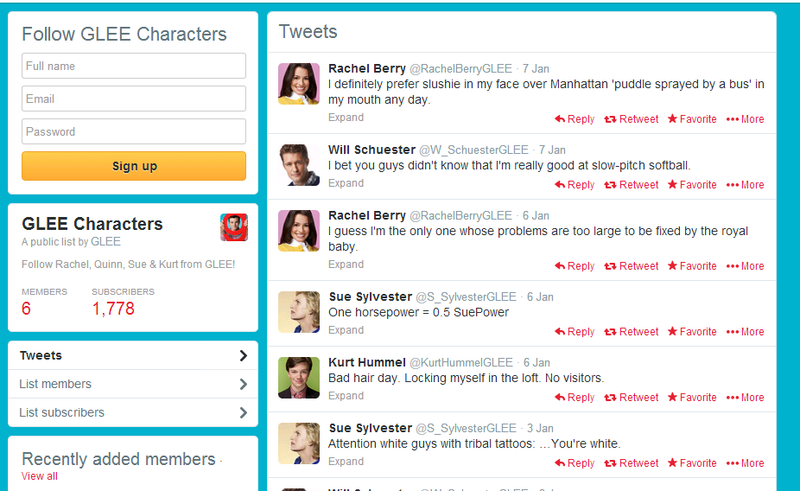 Glee has separate twitter accounts for each of their characters which can be seen in the images at the end. This is a form of hypertext fiction. Glee uses twitter and acts as there character for each twitter account. For example, a character named Rachel Berry who is a performer. While she is in high school she is trying to be discovered. Glee during this season made a tweet on her character account and tweeted “In the meantime, I’ll do my makeup and see if I can get discovered at the Manhattan mall”. As you can see this shows the character Rachel Berry acting as her normal self. This tweet does not add to the story. But some of them do. Multiform storytelling is when a show uses transmedia in different story telling ways. Glee does a small amount of this but none the less they do it. In one of the latest episodes, Glee aired an episode where the students of the Glee Club coached by the character Will Schuester go out and play softball for some fun time. But before the episode was played, Will Schuester tweeted “I bet you guys didn’t know that I’m really good at slow-pitch softball.” This added to the story showing that this character was thinking about this. This form of trans media is an in-character social media account. So this cannot alter the whole plot of the show Glee. I however think that it does in fact add to the story. When you watch a show you are under the impression that anything that happens in that television screen is the characters life. But anything that is put on the web for a reason adds to the story. No matter how little or how big it does this, it changed the perception we have for the characters because it changes the identity of the character closer to real life. “Official Glee Cast and Character Twitters!” Wetpaint. N.p., n.d. Web. 09 Mar. 2014. “Transmedia Storytelling 101.” Confessions of an AcaFan. N.p., n.d. Web. 09 Mar. 2014. “Twitter.” Twitter. N.p., n.d. Web. Henry Jenkins writes in his article What Wikipedia Can Teach Us About New Media Literacies, (part 1), “According to a recent study from the Pew Center for Internet & American Life, more than half of all teens have generated media content and roughly a third of teens online have shared content they produced with others. In many cases these teens are actively involved in what we are calling participatory cultures.” So more than half of teenagers are actively involved in the online intelligence media websites. This shows the amount of collective intelligence there currently is on the web. With the Wikipedia page about the Diamondbacks, about 82 percent of the edits on the page were major edits (this can be seen in the picture at the end). This is a pretty big amount. If 82 percent of the edits were major edits, that that means 1,711 of the edits were major edits. With this many edits, I feel like the answer to the question “Is Wikipedia a good source for collective intelligence?” is yes. I thoroughly read thru the Wikipedia webpage for the Diamondbacks, and I could not honestly find one thing wrong with the page. I also did some research from the Diamondbacks website and everything is accurate. Now this being said, I do not believe every page will be 100 percent accurate, and this is also why I do not think Wikipedia is a good source for school projects and good sources to back up information. For one, there are edits on each page all the time, so what is information now on the page could be gone in a matter of days. And second, it is an encyclopedia. Encyclopedias are not used for sources in the first place. But, Henry Jenkins writes in part 2 of What Wikipedia Can Teach us about New Media Literacies, “On the other hand, participants are encouraged to see themselves as members of a knowledge community and to trust their collaborators to fill in information they don’t know and challenge their claims about the world”. So should we trust what is in there because we don’t know it? I say yes because thousands of people are reading this and editing this, so if there is bad information in there, it is most likely to be taken down. “D-backs History | Dbacks.com: History.” Arizona Diamondbacks. N.p., 14 Feb. 2014. Web. 16 Feb. 2014. Jenkins, Henry. “WHAT WIKIPEDIA CAN TEACH US ABOUT THE NEW MEDIA LITERACIES (PART ONE).” Confessions of an AcaFan.http://henryjenkins.org/2007/06/what_wikipedia_can_teach_us_ab.html, 26 June 2007. Web. 14 Feb. 2014. Jenkins, Henry. “WHAT WIKIPEDIA CAN TEACH US ABOUT THE NEW MEDIA LITERACIES (PART TWO).” Confessions of anAcaFan. http://henryjenkins.org/2007/06/what_wikipedia_can_teach_us_ab_1.html. 26 June 2007 Web. 14 Feb. 2014.